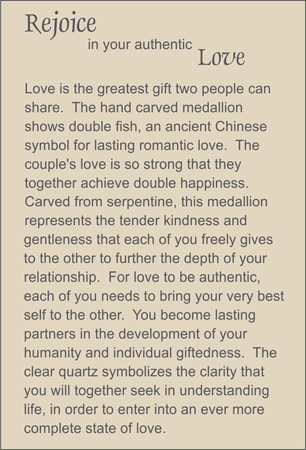 This hand carved carnelian medallion depicts two fish surrounding the symbol for double happiness which was considered by the ancient Chinese to represent that each person gives double the happiness to their partner in a loving relationship. This medallion is suspended from a necklace of carnelian tumbled nuggets that is inset with two fiery agate nuggets surrounded by faceted amethyst ellipses. Trios of faceted red tiger eye ellipses are flanked by rock quartz slivers. Sterling silver toggle clasp. PACKAGING: Comes with story card and signature black velvet storage pouch. See other styles by scrolling down. Usually ships in seven business days. Eligible for refund or store credit within 7 days of receipt. www.barbarabacigalupi.com is a part of UMANO, 952 School St, #203 Napa, CA 94559. Copyright © 2017 UMANO Inc All Rights Reserved.